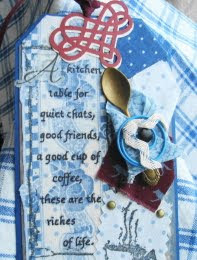 Vada's Blog Stamp Inks and Paper : Tag Tuesday at Kard Krazy is Fabric. Boy nothing like posting this on the last day of the challenge. I also would like to add this to our Gingersnaps Challenge #85. This is lovely, the little spoon is adorable. Love your tag with the heartwarming sentiment, the spood and rick-rack. It's wonderfully photographed as well. 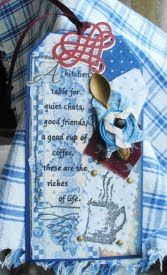 Love the spoon added to your fabulous tag! You are always amazing!